Why is SHEconomy, your business? And why should we care?Today we are facing a new emerging market that will dwarf the size of both the population and GDPs of China and India. Which Emerging Market will redefine society and the world? Women. Globally, women control about $20 trillion in annual consumer spending and that figure could climb as high as $28 trillion in the next five years. In aggregate, women represent a growth market bigger than China and India combined (Fagerland & Drejer, 2018, European Journal of Management). "Gender equality is often viewed as costly. But the price of inequality is much higher” (Fagerland & Bryn Rambøl, 2015). The importance of women as consumers, voters, employees, managers and board members is becoming recognised as an expression of business health, maturity and economic viability. But at the same time it seems that the debate about women in industry has stagnated, at least in this country. In the case of female senior executives, both the lack of them in themselves and the debate about this lack are clear evidence that we still have a long way to go (Fagerland & Bryn Rambøl, 2015). “It is much easier for a Norwegian woman to become a minister than a CEO”, said Minister for children and equality, stated Linda Hofstad Helleland in here keynote at the Sheconomy and Facebooks event, June 2018. We are likely to look back at the beginning of this year and recognise that it was a turning point: the time when equality became a business strategy and a global economic issue. When the women, for the first time, constituted the majority of the workforce in countries such as the United States and Australia. When economic crises destroyed our trust in capitalist meritocracy, developed and led almost exclusively by men. And then all actors in business began to take an interest in the gender perspective (Fagerland & Bryn Rambøl, 2015). Gender inequality is a pressing human issue but also has huge ramifications for jobs, productivity, GDP growth, and inequality (McKinsey, 2015). In September 2015, MGI published a global report, The power of parity: How advancing women’s equality would add $12 trillion or 11 per cent to global gross domestic product (GDP) by 2025 and if women and men played an identical role in labour markets, global GDP would grow by $28 trillion, or 26 per cent, by 2025, according to McKinsey (2016), and for comparison, that is nearly the equivalent to the United States and Chinese economies combined. 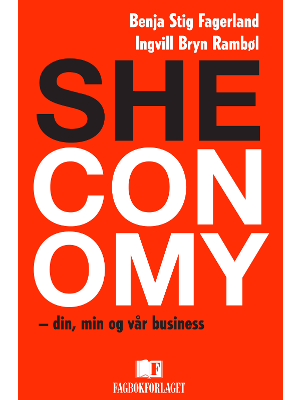 In other words, SHEconomy is a substantive and effective form of economic stimulus. The call for gender diversity is therefor all about being inclusive, CDR (Corporate Gender Responsibility,Fagerland 2015/ Fagerland and Drejer, 2018) and profitable (Fagerland & Drejer, 2018, European Journal of Management). SHEconomy- your, mine and our business is about the business potential that lies within female leadership, and about taking women seriously as consumers and as an aspect of political power. This book explores how women take action and make decisions- and how to best utilise these observations to improve competitiveness and profitability, as well as handling key societal challenges. The book highlights that women are big business. And those who realise this, can truly move market shares, win votes, foster values and strengthen the bottomline. Womens growing economical and political power will innovate the way we perceive business, products and politics. Whilst we during the last century experienced what a change it was both for the government, market and society that women entered the labor market,- we will in this coming century witness the results of the next step in this development. In fact, what it entails when women becomes equal players on both the power and monetary field. Hence, SHEconomy is your, mine and our business! This book is recommended reading for all current and future decision makers, in both private and public businesses, political parties and media; for anyone who wants to participate in and compete for our times’ greatest untapped potential- in fact, women! © 2018 SHEconomy AS, Inc. All Rights Reserved.